Our Troop is chartered by St. Simon Parish in Los Altos. We meet on Monday evenings 19:00 - 20:30. Troop 103 is one of many Boy Scout troops in the United States. Each has a slightly different emphasis on program approach. One of the most important parts of our First Year program is to make sure that new Scouts feel comfortable in our troop. We respect the aims and methods of Scouting while providing a fun and interesting program that motivates our Scouts to advance through the ranks while enjoying a wide range of activities and gaining new skills and experiences along the way. We have committed and trained adult leadership. Our leaders have many years of Scouting experience. Our Scoutmaster, Mr. Siler, has been in Scouting for 24 years and he has been our Troop Leader since it's beginnings in 2005. We feel so blessed to have such an experienced, dedicated and a passionate leader who tremendously enjoys working with our boys. Troop 103 has 35 registered Scouts. This enables us to be flexible in scheduling and working with boys on an individual basis. Small troop size also means increased interaction between older and younger Scouts, more opportunities of significant leadership, and more activities open to Scouts of all ages. Outdoor activities are the primary focus of our program. Our Scouts have opportunities to participate in at least one outdoor activity every month. A broad variety of activity types that we offer appeal to a wide range of interests, keeping the program fresh for our Scouts. Our adult leaders do not do anything that Scouts can do themselves. We are firmly committed to the concept of Scouts leading Scouts. One of the fundamental underpinnings of the Scouting program is the concept that a troop is “run by the Scouts”. 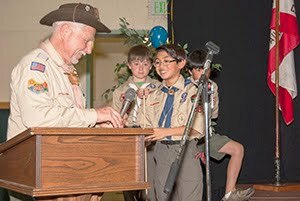 We emphasize leadership training at all levels and encourage our Scouts to learn and work together. Finally, we never forget that Scouting is “fun with a purpose”. We strive to keep our activities interesting and fun, led by the principles that make Boy Scouting one of the finest programs available to youth today. We are glad that you stopped by to visit our site. If you are considering joining our Troop, please feel free to also visit us at one of our weekly meetings.